From a document relating to the purchase of minerals from Mr.Rodgers of Staveley and under land belonging to Mr William Leech of Manchester and Mr.William Swift of Staveley, who were all joint owners. Dated 24th. March 1840. "Supposing the coal could be braught into the market its value would be £150 per acre, but in all probability the coal may lye unwrought for sixteen or seventeen years. The present value for money down would be as under allowing the purchaser five per cent compound interest for twenty seven years £40 per acre". 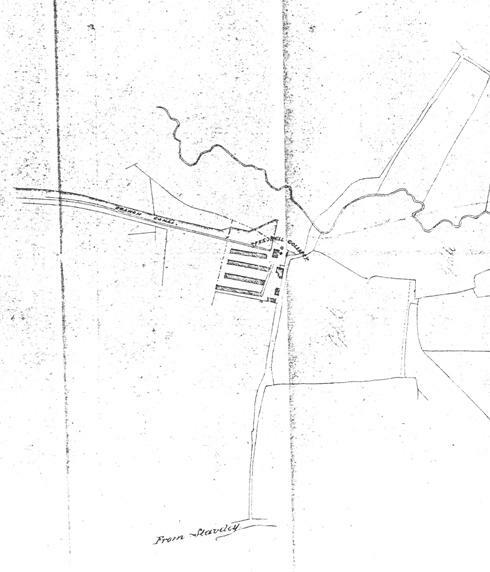 "There is also a coal lying about fifty six yards above the Top Hards coal producing about 2,800 tons per acre, which I make no doubt will be workable in this part of Staveley at a moderate depth from the surface". "I also expect some ironstone called Inkersall Rake, this Rake is got in Duckmanton Parish producing about 1,932 tons to the acre with all the other beds of coal and rakes underneath". Namely. The Measure and Ball Ironstone now wrought at Norbriggs. The Redfern Rake of Ironstone. The Deep Hard or Potters Coal. The Three Bedded or Tomlinson Thin Coal. The Dog Ironstone and Dogtooth Coal. The Broad Oak or Furnace Coal. The Brampton Moor Thin Coal. "The coal and ironstone that lyes underneath the Top Hard coal will be very deep and not workable in our time". J.Cottingham of Hardwick Hall. From J.Ashton. Letters from the Chatsworth Collection. Chatsworth records office. 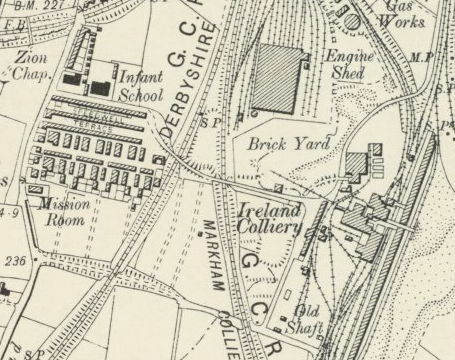 The colliery is working in 1880 but appears not to be by 1896. It would appear that the colliery was eventually superseded by Ireland colliery on the same site.